Originally published in 1991. 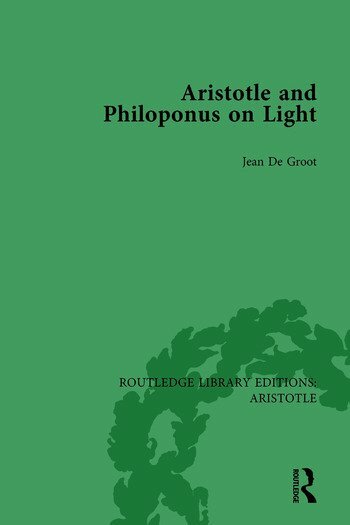 Philoponus’ long commentary on Aristotle’s definition of light sets up the major concerns, both in optics and theory of light, that are discussed here. Light was of special interest in Neoplatonism because of its being something incorporeal in the world of natural bodies. Light therefore had a special role in the philosophical analysis of the interpenetration of bodies and was also a paradigm for the soul-body problem. The book contains much about the physiology of vision as well as the propagation of light. Several chapters investigate the philosophical theory behind what came to be known as ‘multiplication of species’ in medieval light theory. These issues in the history of science are placed within an analysis of Neoplatonic development of the distinction between Aristotle’s kinesis and energeia. The book treats Philoponus’ philosophy of mathematical science from the point of view of matter, quantity, and three-dimensionality. Jean De Groot is Professor of Philosophy at The Catholic University of America in Washington DC.